Tobey Maguire’s aura of youthful sensitivity and his dry, understated delivery have allowed him to corner the market on coming-of-age roles. In the late 1990s, he was a standout in a steady stream of dramatic features. With the premiere of “Spider-Man” in May of 2002, Maguire has managed to parley that early success into a shot at big-budget stardom. Maguire’s father, Vincent, and mother, Wendy, were young and unwed when he was born. Although they married soon after the birth, their relationship was short-lived and Maguire spent much of his early childhood shuttling between households in California, Washington and Oregon. Maguire’s mother, a secretary, encouraged her son to take acting lessons and soon she was escorting him through the standard circuit of Hollywood auditions. Maguire managed to cadge one- and two-line roles in such sitcoms as “Roseanne” and “Blossom.” Maguire left school in the ninth grade to devote himself to acting. He eventually landed a lead role in FOX’s ill-fated “Great Scott!” The show was cancelled in 1992 after nine weeks. In 1995, Maguire auditioned for the lead in the Generation X comedy “Empire Records.” He was given a small part and eventually excused himself from the production, citing personal frustration. His scenes were cut from the little-seen film. But this personal setback proved a prelude to giant professional leap forward. After a brief sabbatical from the audition circuit, later that year he appeared in “Duke of Groove,” a short-film which received an Oscar nomination. He then leveraged a role in Woody Allen’s “Deconstructing Harry” and following that, a major role in the brooding, Ang Lee drama “The Ice Storm.” Maguire’s performance as Paul Hood, the sardonic-but-sensitive son of Kevin Kline and Joan Allen, earned high praise from critics. In 1998, Maguire again played the fictive son of Joan Allen in “Pleasantville,” but this time, it was Maguire in the lead role. After a small role in the film adaptation of Hunter S. Thompson’s “Fear and Loathing in Las Vegas,” Maguire again played the coming-of-age card in “The Cider House Rules,” a wistful interpretation of John Irving’s bestselling novel.The film garnered seven Academy Award nominations. In “Wonder Boys,” Maguire found himself playing a slightly quirkier version of the prodigal son. Cast opposite Michael Douglas, Maguire played James Leer, a precocious writing student with a flair for prevarication. But with the release of “Spider-Man,” Maguire’s days as the Holden-Caulfield-in-residence seem to be over. Maguire (with the help of a range of state-of-the-art special effects) made the transition from nerdy teen Peter Parker to comic book hero. The film also features Kirsten Dunst and Willem Dafoe. The film netted $114 million in its opening weekend, a box-office record. The actor signed on for the sequel “Spider-Man 2″ in 2004. In 2006, Maguire starred in the Oscar-nominated film, “The Good German.” Maguire returned once more as Peter Parker in “Spider-Man 3″ in 2007. In 2009, Maguire starred alongside Jake Gyllenhaal in “Brothers.” For his performance, he was nominated for a Golden Globe for Best Performance by an Actor in a Motion Picture — Drama. Maguire portrayed Nick Carraway in the much-anticipated film “The Great Gatsby” in 2013. The Baz Luhrmann-directed adaptation was a box office hit. Do you want to hire Tobey Maguire? Directly request a quote. In 48 hours we can send you the availability of Tobey Maguire If you would like to book Tobey Maguire, Entertainment Booking Agency is the right place. 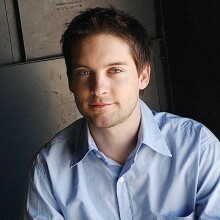 We will offer you the best price and contact the management or we directly contact Tobey Maguire. For corporate appearances or speaking engagements you can contact our agents and the will help you true the process. Tags: hire Tobey Maguire, Tobey Maguire booking, book Tobey Maguire, Tobey Maguire appearances, find more information on booking Tobey Maguire for appearances, Tobey Maguire speaking engagements, Tobey Maguire endorsements/spokesperson, Tobey Maguire appearance fees, Tobey Maguire booking agency contact info, biography of Tobey Maguire, Contact an artist booking talent agent find a speakers bureau that can book Tobey Maguire, speaker booking agency for Tobey Maguire, Tobey Maguire booking agency, Tobey Maguire booking for corporate event. EBA is one of the biggest entertainment booking agencies in the World. We book hundreds of celebrities, artist, athletes and speakers in a year. Important to know is that we are not claiming to be the management of Tobey Maguire. We are not the official agent for Tobey Maguire. Companies from around the globe book these artists and speakers true our company be course we have one of the biggest networks and we always have direct contact with the artist or the management. We help you to find the right celebrities for your corporate of private events. Please contact one of our agents to get free advice and we will help to get the world-famous artist on your party.